DISCUSSION: Core Values of the Hizmet Movement and Manifesting Institutions – Pearl Of The Islands Foundation Inc.
Dr Alp Aslandogan, Executive Director of AfSV (https://afsv.org/) was in New Zealand for a series of meetings and events following his visit from Australia. 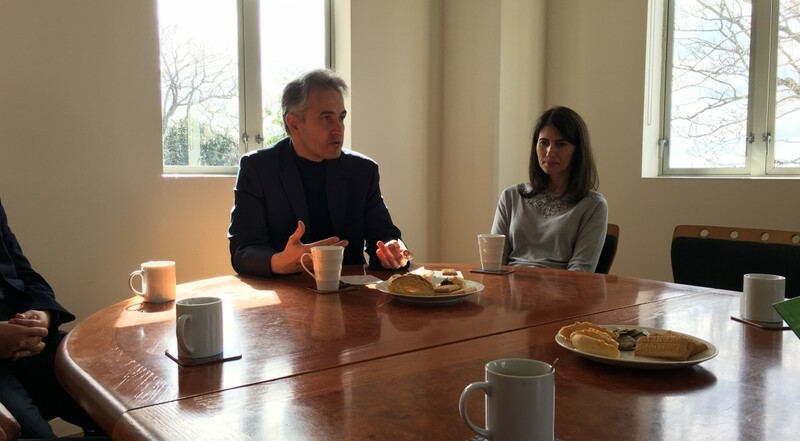 After a brief welcome, Alp introduced himself and described his experiences and engagement with the Hizmet Movement. Dr Aslandogan’s interest in religion and the Hizmet movement increased following the discovery of the Fountain Magazine (https://fountainmagazine.com/) that intertwined science and elements of religion together, that so happened to be edited by Fethullah Gulen. He described Hizmet as a transnational civil society initiative that advocates for the ideals of human rights, equal opportunity, democracy, non-violence and the acceptance of religious and cultural diversity. Hizmet participants are inspired by the ideas, life example and vision of Fethullah Gulen, an Islamic scholar, preacher, social and peace advocate, who has a decades-long commitment to education, altruistic community service, and interfaith harmony. Gulen wanted to tackle social issues the country (Turkey) was grappling with. Interfaith dialogue was a way to build bridges between groups that were tense toward one another. Education was also another method to break down stereotypes, reduce prejudice, and increase educational attainment rates. So, the movement essentially began with just mosque-goers to a wider education-based movement that included many more people who were able to contribute their time, resources, skills, and more for the sake of a more peaceful, enlightened and prosperous world. During the 1990’s and the 2000’s Turkey opened up to the world through economic and political reform which allowed the Hizmet Movement to take its first steps in becoming a transnational movement. Recently there have been comments made on the political affiliations of Hizmet Movement supporters. Dr Aslandogan clearly indicated that the political beliefs of individuals do not represent the Movement itself. Each participant or supporter will have their own views. Parties that encompass and manifest the core values, principles, and ideas of our Hizmet Movement have usually received support from Hizmet participants. The current prevailing political party in Turkey received increased support from Hizmet Movement affiliates in their early years for their positive attitude towards democracy, human rights, economic policies, furthering education, and overall their positive approach to how they governed the country. The 2013 corruption probe into the government at the time caused a dilemma for some Hizmet supporters as they initially had placed a lot of trust in this party and supported them in the polls multiple times. When Gulen and supporters no longer supported AKP, they paid the heavy price with a massive witch-hunt and purge (https://turkeypurge.com/). Following his initial introduction, some questions were directed to Dr Aslandogan. What can we say to people who say that the Hizmet movement is political? Media focuses solely on the negativity, so I don’t think it is a fair representation of what the Hizmet Movement is. It is not political. We are involved in educational and dialogue related activities worldwide. Much of our humanitarian work including cataract surgeries, water wells, schools, dormitories, hospitals and many more have not seen any press. Thus, it is difficult, from our standpoint to defend ourselves when our work is not seen by many, but many people see the false accusations and allegations by negative media coverage instead. Which Muslim dominated countries have Hizmet schools? Iraq, Philippines, India, Pakistan (recently closed), Indonesia, Nigeria, Afghanistan, Bosnia, Somalia, and more. What is the future of the movement? Turkey may have closed thousands of our institutions (schools, hospitals, cultural centres, dormitories, universities, media outlets) but our focus is on the work we undertake around the globe. While our ability to help those in Turkey is heavily restricted and hindered, we continue our efforts in dialogue and education and advocates for the ideals of human rights, equal opportunity, democracy, non-violence and the acceptance of religious and cultural diversity. The table discussion came to an end following the questions. Light refreshments were served.